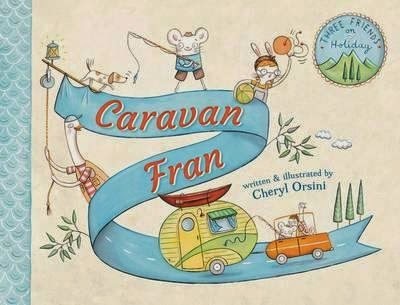 I've long adored Cheryl Orsini's illustration work, and here as author/illustrator, this talented creator brings us an adorable story about three animal friends who take a trip to the seaside--in their cute-as-pie caravan, Fran. Oh, how I want that caravan. Even as an adult, I so love peering inside things. To see the inner workings, to see how people live. The second double page spread fills my desires beautifully, as we get to see what three friends might take with them on their caravan adventure. Then it's ready set go--over the rolling hills to the water. Literally. When the caravan hits a rock by the creek, poor Ray the basset hound tumbles into the drink, and Sam dives in to save him. But now they both need rescuing! Gorgeous scenes of the seaside town, its creek and seashore, showcase the characters as they scrabble to help rescue their friends, set up camp and begin their holiday. Cheryl's beautiful, iconic illustrations are visual joy, and gorgeously complement the lolloping rhyming text. Being a short story--just 24 pages--it still contains a medium amount of text. The book would therefore be ideal for children wanting to advance their reading towards chapter books, with its well-rounded classic storyline.